I have been meaning to post this giveaway up weeks ago but unfortunately, something called work got in the way. Never fear - better late than never. Given I’ve been on a nail lacquer obsession lately, this giveaway is all for a set of the OPI Lil Shooters Collection. This set is from the Texas Collection released last year and I must say the colours are gorgeous. I bought this intending to keep it for myself but decided that with 4 shoe boxes of nail polishes and a Best of OPI collection still in its box untouched, I won’t miss these babies too much if I was to give it away to a good home. If you don’t have Facebook (or want another entry to the competition), then fear not – just subscribe to the blog via email and importantly, leave a comment below with your email address so I know you want to win the Lil Shooters set. Please include your email address for verification purposes (feel free to change the email format to confuse spam bots or alternatively, you can email me if you want your email to stay private). Existing subscribers just need to leave a comment with their email details. Here are some more nitty gritty details. This giveaway is open to readers worldwide – yes international readers are eligible to enter. Readers may enter via liking the Things I Love Facebook page and/or subscribing to the blog via email and leaving a comment below. A maximum of 2 entries is allowed per reader. The competition period runs from 27th March till AEST midnight (GMT +10) 5th April 2012. The winner will be randomly drawn by 10th April. 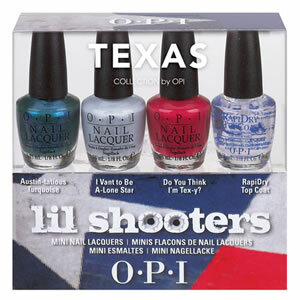 The prize is a set of OPI Lil Shooters mini nail polish set valued at A$24.95. The judges (by that I mean yours truly) decision is final and no correspondence will be entered into. The winner will be announced on the blog and via social media channels Facebook and Twitter. Simple No? Now that you have all the details, go on - enter the giveaway now! Hi thankyou for the opportunity to win! I've liked your FB lage and posted a message on the wall. Your competitions are so good! I am your number 214 member! Thank you for this competition, love OPI products. 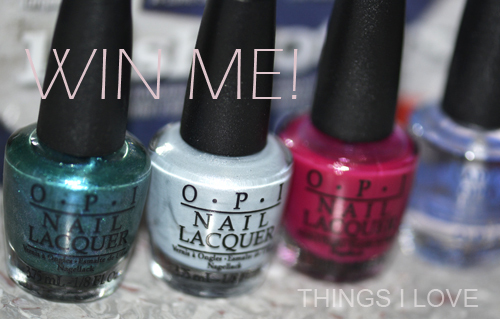 I'm a fan on Facebook as Kate Ryan :) Thanks for an awesome giveaway, I'm wearing OPI on my toenails right now. subscribed and commented! Thank you!